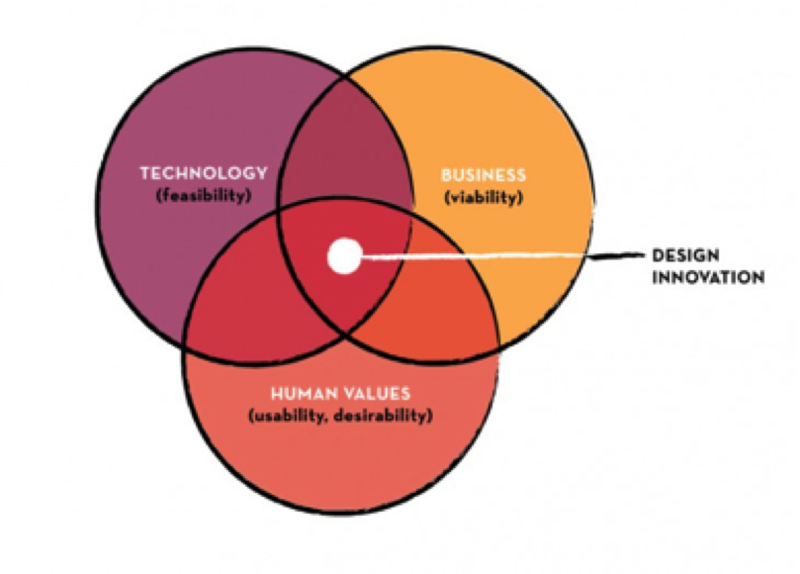 The schema below illustrates this sweet spot for design innovation. Design is human-centred, beginning with deep empathy and understanding of people’s needs and motivations. Design helps make products, services and systems more useful and usable. Design is collaborative and multi-disciplinary, requiring the expertise and participation of many people, including those who use and deliver services. Design is optimistic, at its core there is a fundamental belief that we can create change. Design is experiential, the design process is all about devising experiments, testing things out, taking risks and embracing failure so that we can learn and refine ideas. Whether we are focused on innovation as doing something better than how we used to do it, or doing something completely new, design can support organizations to innovate. ‘Design thinking’ refers to both a process and a mindset. Design is a process driven approach. Its process provides structure so that creativity can freely bubble up. Design thinking involves an iterative process that has distinct stages. There are different models used to communicate the design process, for example the process below is from the Stanford D-School. Empathize : You have to empathize with your users. This means getting to know them through interviews, observations and learning how they would possibly interact with your product/ service/organization. Test: Now this is where you can put your prototype in front of users, learning how they interact with it and thus allowing you to refine your ideas and increase your understanding. Traditional business mindsets tend to be problem-focused. A problem is identified and solutions are generated and implemented. I have seen so many briefs formulated without a real understanding of the problem at hand. Often initiatives solving the wrong problem are executed, wasting valuable time and resources. Comfort with ambiguity – Designers do not rush to solutions, they are comfortable exploring the problem space first, ensuring that they are solving the right problem. Question – Explicating and unpacking assumptions is at the core of a design mind-set. Understand what assumptions are being made. Go talk to people to make sure that they are true. Empathy – Be human-centred. Consider the points of view of the people in your service or product eco-system. Observe people. Talk to them. Understand their worlds and their life contexts. Making – A design mindset makes to think. Stick man sketches to envision the people involved in a service, or using lego to envision product distribution. Create models to explore complexity and tell stories about people. Optimism – A design mindset is focused on possibility. Designer’s prefer to use the term “yes and” instead of “no but” when considering possible futures. Feedback – Understand the need of getting feedback. Be OK with showing half-baked ideas or prototypes. By talking to people about possibilities they become better. Collaboration – A design mindset values collaboration and the different perspectives needed to solve complex problems. Involve others . Design provides a valuable approach to problem solving, it requires a designerly mindset, available to everyone. I’m seeing elements that I use in my design work, and sometimes have to explain to clients, who do tend to confuse design with ‘making things look pretty’…so thanks for sharing such a reminder of basic principles, so clearly articulated.